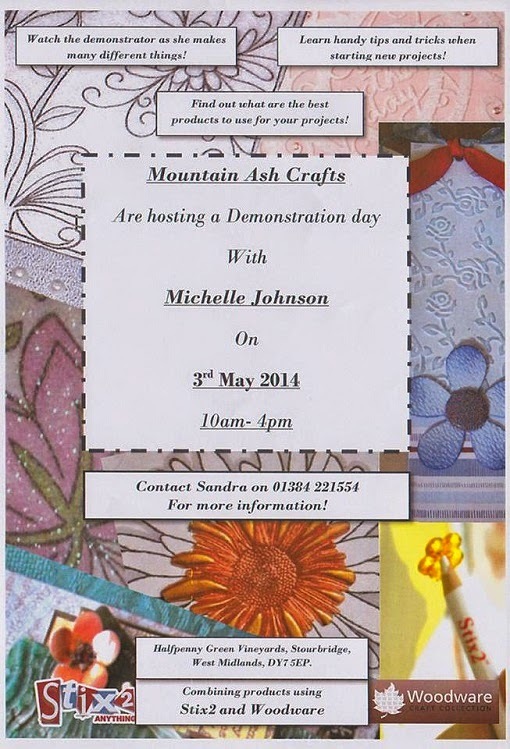 On Saturday May 3rd Mountain Ash Crafts will be joined by Michelle who will be showing more projects and ideas using a range of our Stix2 Products. A great big thank you to everyone who joined us today for our demo day with Michelle Johnson. The make and takes were a great success and lots of our crafters said how much they enjoyed watching the demo and being able to make something themselves.We had three classes of make and takes with a total of 39 people enjoying creating products including children. The make and take project was to create a dragonfly tag. We used lots of products and lots of techniques. 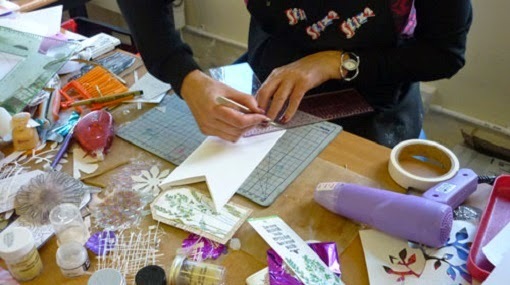 The Stix2 tag was matted onto patterned paper and Michelle showed us how to get a perfect layer all around using the Stix2 Layer Perfect tool. The body of the dragonfly was filled with hot glue and then beaded or glittered. Everyone enjoyed doing that! We also paper pieced, and used a clear Sakura stardust pen as well as the black glaze pen to embellish the design. We also coloured and shrunk ribbon. The tag could be added to a gatefold card if wished. Here is an example of one made. Something everybody was very pleased with was that the Stix2 Iridescent Glitter can be coloured with promarkers or Spectrum Noir pens! 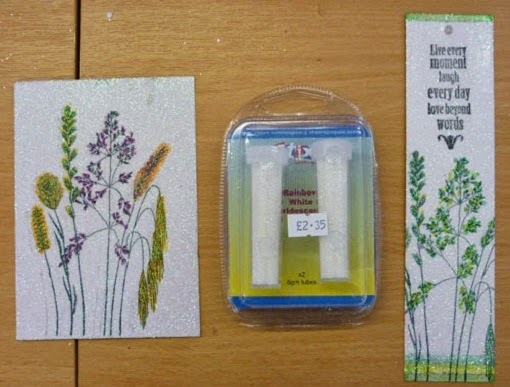 Michelle has stamped this Summer Weeds Woodware stamp onto white card with black ink. A piece of Stix2 double sided adhesive has been stuck on top. The top layer is then removed and the whole piece of card covered in the glitter. Burnish (rub it in!) and then you can add colour on top! The effect was brilliant. We sold lots more of the Layer Perfect tool so if you would like to see a recap on the many ways it can be used click here. A big thank you to Stix2 and Woodware who sponsored today.Their support is much appreciated. A maze of Memories - Long Crendon have Michelle joining Christina and her team for the days. Wilmslow Garden Centre - Cheshire will be joined by Karen showing off her knowledge from 10am - 4pm. This happy little chickie will make any Easter Day! Use it to share an Easter note or your Easter greetings. Perfect for Kids! Cut a piece of the dotty paper 3.5" x 5". Cut a strip of the yellow stardust card 3.5" x 9". Stick the dotty paper on the white side of the stardust card at one end using the tape runner. Using the scalloped die place it at the end with the dotty paper stuck to it and hang half the die off the die cutting machine so that when it goes through it'll only cut half the die on the card. Fold the stardust card back on its self at 3.5" to create the pouch and stick together with the polyester tape. Layer the white oval on top of the scalloped cream oval. Stick the other white oval onto the white side of the yellow stardust card you have left over. Cut around this and then cut the oval in half. These are to make the wings. Punch out two orange flowers and cut them down to make the feet. Use one of the left over orange petals for the beak by cutting it in half. Put double sided tape down the edge of the pouch and don't forget to place the wings inside before sealing together. Stick the layered ovals in the middle of the front flap, add a greeting if you wish. Stick the beck and feet on using the polyester tape. Tie ribbon round the tag and put it in the pouch & then stick the googly eyes on. Again, add a greeting onto the tag if you wish. Snetterton Park in Norfolk have Annette joining Rushanne and staff sharing her knowledge and handy how to's. Papercuts - A Slice of Imagination in Whitley Bay have Michelle joining Shirley and Jo-Anne showing fantastic techniques with the Hot Melt Glue Gun. Ladygreen Garden Centre in Ince Blundell, have Kirsty joining Liz and her team in their dedicated craft shop creating some fantastic new projects with Stix2 products. 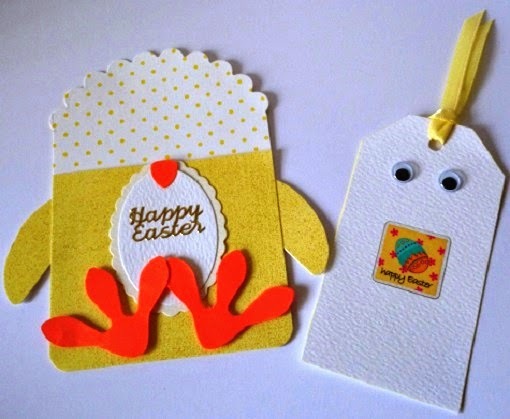 Have a "Hoppy Easter" with this colourful card! Cut a square of white card measuring 9.5cm x 9.5cm. Stamp the bunny onto the right hand bottom corner of the piece of card and stamp a second one onto patchwork-patterned paper using black memento ink pad. Colour the rabbit with a fawn alcohol maker and give a shadow with a grey alcohol marker. Cut out the patchwork dress and stick onto the white rabbit with a red tape runner. 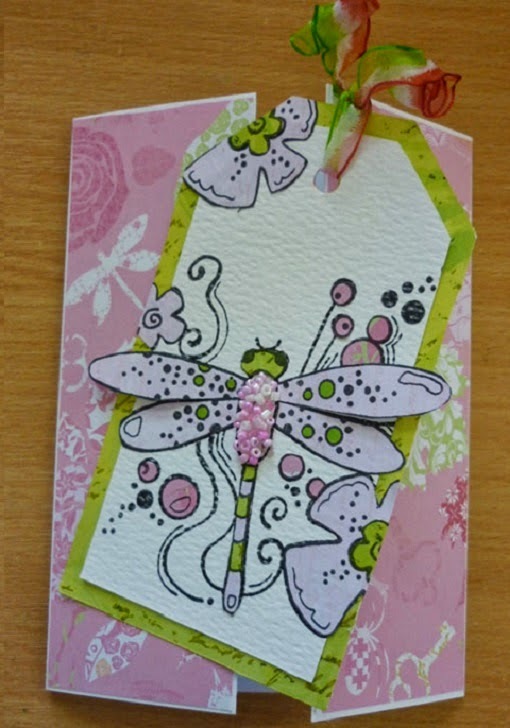 Use the Layer Perfect to create an even border with a bright pink card, then attach centrally to the card using the Layer Perfect to find the central position. Stamp the greeting with black ink onto white card and repeat the previous step to create a perfect border all around the greeting. Attach to the left side of the bunny rabbit using the 3D foam strips, cutting them to your chosen size. Use the grey pen to draw over the black lines to make them stand out. Attach a die cut flower to the corner, add a circle of hot melt glue and cover with micro beads whilst wet and hot. Create a row of three hot melt glue dots down the right hand side of the card and again add micro dots to them whilst hot and wet. Set aside to dry and cool. Colour the flowers with a pink tombow pen. For making micro beaded gems. Practice by making a small circles of glue. 1). Press to release glue. 2). Release trigger and lift the gun mid air. 3). Twirl gun around in circles to snap of any trails and the air will also help to form the glue into a perfect circle. This week we have a quite a few demonstrations happening for you both during the week and at the weekend. Crafty Company in Fleetwood, Have Kirsty joining Sandra and her team on Thursday 10th April combining Stix2 products with Woodware and showing how well they work together. 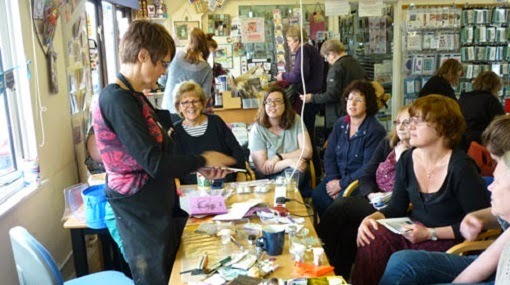 A trip Down Memory Lane, Suffolk, are welcoming Annette with a fun filled day of crafting how too's by Jill and her team on Friday 11th April. Craft-ed Creations in Alloa, Have our lovely Emma joining Karen and her team on Saturday 12th April focusing on the Layer Perfects. In2 Crafting, Wickford, Have Michelle joining them for a day of fun, ideas, projects and demonstrating the best way to use our products. We hope you can join us for one of these days. Is there a better way to share the joy of Easter than with this gorgeous Chick Bag? Ideal for Kids! Cut the yellow stardust card 6" x 8.5" . Using the Hougie board score at 3" 4", 7" and 8" on the card. The half inch you have left is for the flap. Turn the card round and score that side at 1" this is the base for the bag. Crease all score lines and cut the base flap on the score lines. Using the scallop oval die, cut a hole in the front flap. This is the 1st section in the 3" on the card you scored. Use a piece of left over yellow stardust card & cut the middle sized Dahlia to make the Chicks face. Punch out 2 flower in orange card and cut them down for the feet. Using the orange card, fold a small piece over and cut out the beak. Stick the bag and base together, using the flaps and the polyester tape. Using the orange ribbon, tie a pretty bow and stick this to the body using the silicone glue. Stick the feet, and head on to the body using the polyester tape. Place the googly eyes and beak on the face using the silicone glue and fine nib. 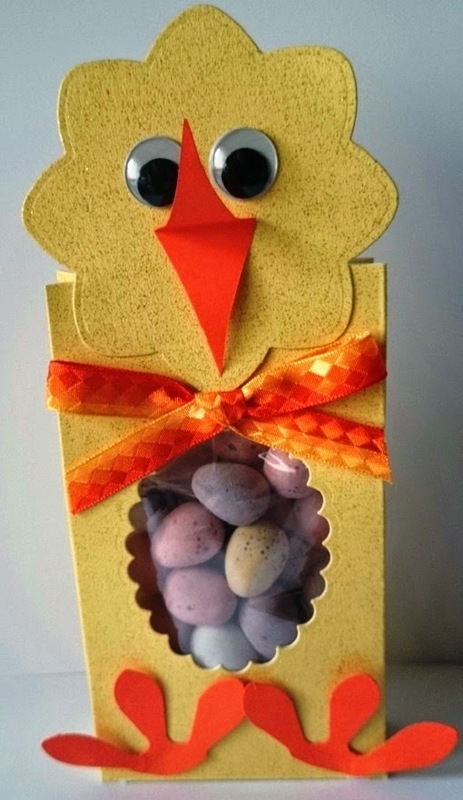 Place some chocolate eggs or other goodies in a self seal card bag and place then inside the chick bag. Use hook and loop circles to seal the bag which will also make it reusable. Brushstrokes, Holme Grange Craft Village, in Wokingham have Michelle joining them for the day. McOyster Paper, Cupar in Fife, have Emma joining Adrian and the team along with Balrema Birds of Prey focusing on the Layer Perfect. Sunrise Crafts, Wonbourne Garden Centre in Wonbourne, have Lisa coming along sharing her crating knowledge. Daleside Garden Centre Craft Shop, Hawarden, have Kirtsy joining them for the day sharing new ideas. Have you got your Easter cards ready? 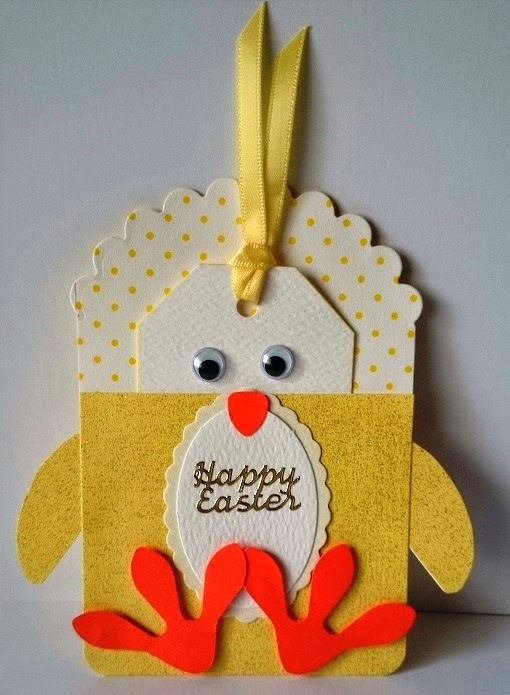 Easter is just around the corner and we have some fun inspiration for you to craft your own cards to share with friends and family. With our Stix2 products this is an easy and fun task to do and you can get the whole family involved. 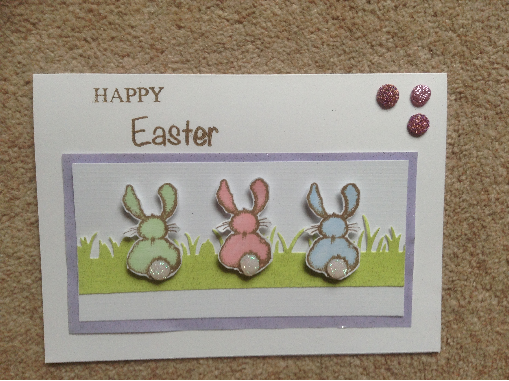 Stamp the bunnies on to plain white card, colour them in and cut out the bunnies. Using the Hot Melt Glue Gun and Hot Melt Glue Sticks put a circle of glue onto the bunny tails and cover in iridescent glitter. Using the Stardust Green Glitter card, either cut out in a grass effect or use a grass die cut. Using the Tape Pen stick the grass onto the White card. Then using the Layer Perfect and Tape runner pen stick the white card to the purple stardust glitter paper to get an exact border. 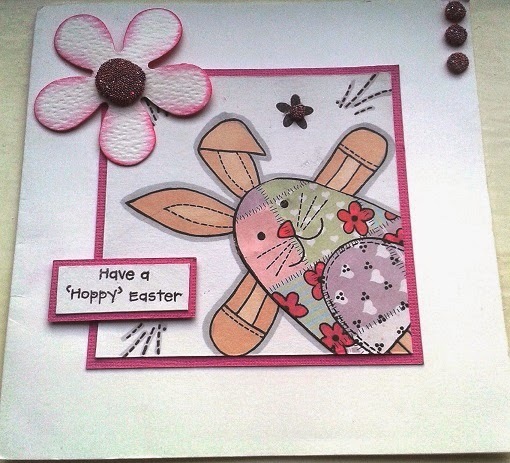 Using the Versafine Ink pad stamp your Easter greeting onto the card. Using the Hot Melt Glue Gun create three dots in the right corner and sprinkle Pink Glitter or Micro beads onto the glue while hot to embellish the corner.